Last September, we told you that Samsung was working on a sequel to its Gear IconX wireless ear buds. We also mentioned a new trademark application filed by Samsung for the name Samsung Galaxy Buds; the latter indicates that Samsung is going to re-brand and improve its wireless ear buds in order to be a more formidable challenger to Apple's popular AirPods. 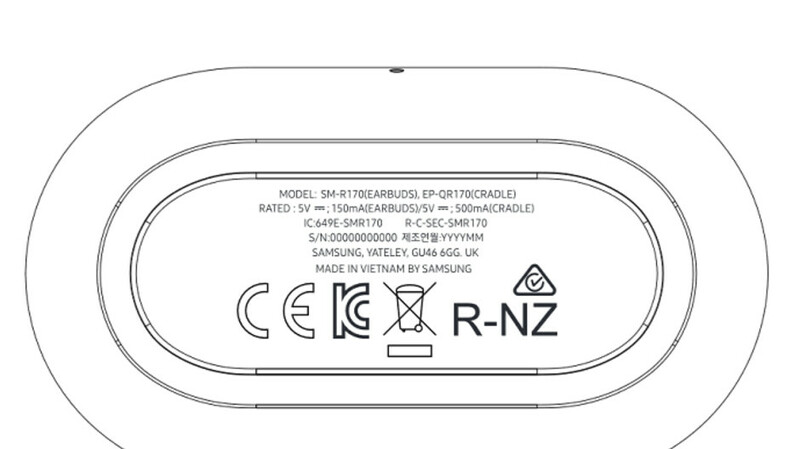 Now, the FCC has certified Samsung's wireless ear buds, and an image made available on the FCC website shows the FCC certification label on the bottom of what appears to be a carrying case for the product (see image at the top of this article). The Samsung Galaxy Buds will be model number SM-R170. While the FCC website doesn't give away that much information about the device, the accessory is expected to be available in black, white, and yellow. The Galaxy Buds will reportedly carry 8GB of native storage, double the amount of RAM on the Gear IconX. That means the Galaxy Buds will be able to store approximately twice the amount of music as the Gear IconX does. Although the FCC didn't mention the Galaxy Buds name, the product's Bluetooth SIG certification did so while also revealing the accessories' support of Bluetooth 5.0. With Samsung's next Unpacked event due to be held on February 20th, the Galaxy Buds could be introduced as soon as next month, alongside the Samsung Galaxy S10 and Galaxy S10+. Ear-worn devices are expected to be the largest segment of the wearables industry by 2022, according to Gartner. The researcher expects 158.43 million units to be shipped that year from 46.12 million units estimated to be delivered this year. That would top the growth in smartwatch shipments, which Gartner sees rising from 74.09 million units this year, to 115.20 million in 2022. Wonder if these be like pod style or like in ear buds? Old men can rejoice....they don't have to be ashamed of wearing their hearing aids in public anymore lol.